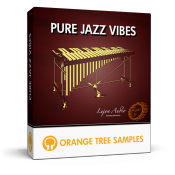 Orange Tree Samples is proud to present Pure Jazz Vibes, a deeply-sampled Jazz vibraphone sample library for KONTAKT. Pure Jazz Vibes features independent close, mid, and far mic positions. It also has 4 dynamic layers and up to 7x round-robin, giving you a total of over 8 GB of chromatic samples.